On Fridays, my family and I are vegetarian. That has been the tradition for as long as I can remember. Friday’s are temple going days and as a nod to our Hindu heritage, we don’t eat meat on temple going days or special festival days. There are days when we don’t cook meat in the house by preference rather than tradition. But pasta with pesto sauce or bean nachos, is very different to Friday vegetarian food. I love it. I could eat this every day of the week. It’s time consuming to prepare though and with our busy lifestyles, you can understand why we only cook like this once a week or for special occasions. 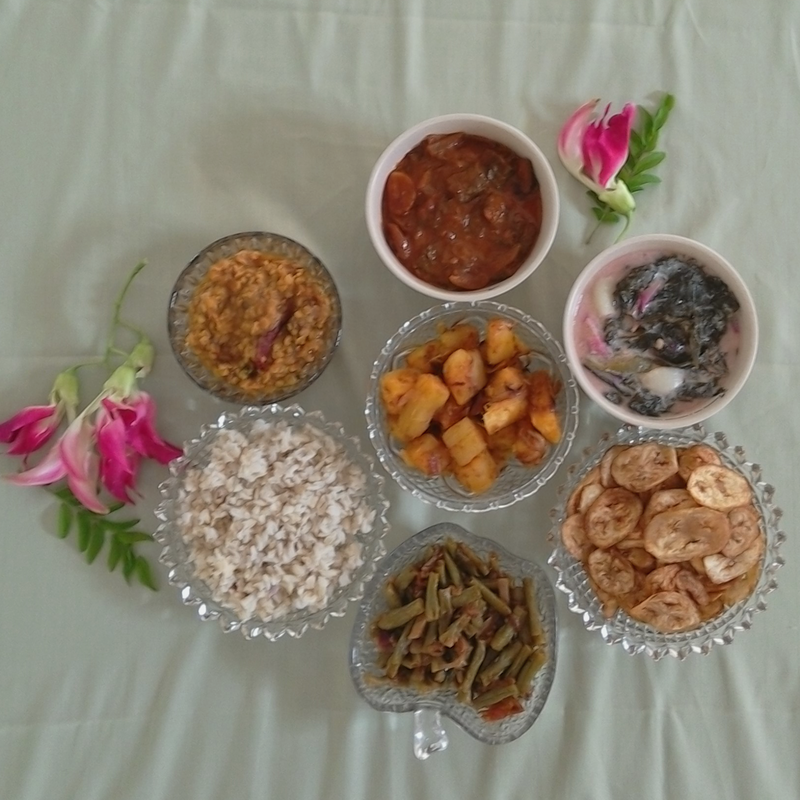 Sri Lankan vegetarian cooking is a balance of flavour, texture, protein, carbohydrates, fibre and nutritional value. As such, in our house, there are a few staple dishes on Fridays. There is always a gravy like red curry (flavour), a tapioca dish (carbohydrate), a dish called ‘sothi’ which has a green leafy vegetable cooked in coconut milk (fibre to make you feel more full), a dhal dish (protein and fibre) and a fried chip of some kind (a crunchy texture and more fibre, protein or carbohydrate depending on the vegetable used). Then depending on how many people are in for lunch and dinner, there might be additional vegetable curries, a salad and a sambal (a pesto like paste made by grinding an aromatic herb with fresh grated coconut). 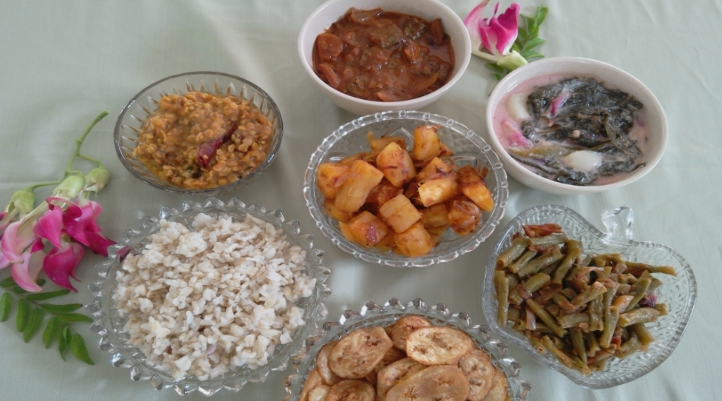 On the menu today we have brown rice, bitter gourd in gravy, boiled tapioca pieces that have been pan roasted with chili and spices, a sothi with sour leaf, red dhal, long bean dry curry and savoury banana chips. My family has an affinity for tapioca. With the exception of myself, they have all substituted rice with tapioca on Fridays. We love it boiled, mashed, fried into chips or boiled and roasted like what has been prepared today. I think it has something to do with both my parents growing up during World War 2. When trade routes were disrupted and what they were used to eating became scarce, tapioca became a substitute. It was quick growing and readily available. 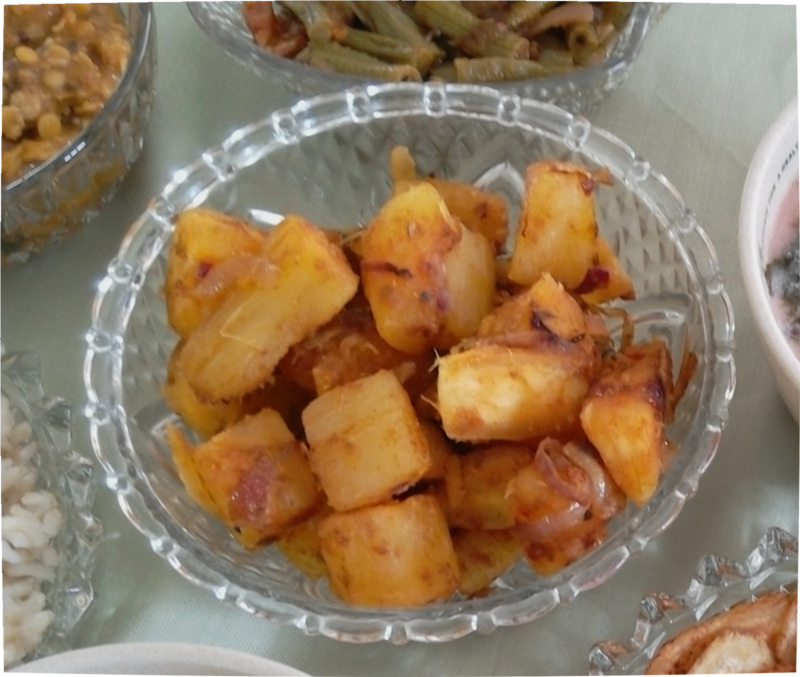 My grandmother devised different ways to cook it and it became a family favourite. Today’s preparation is my favourite although I love tapioca chips too. As much as I like tapioca, I need rice. Another favourite of mine is the sour leaf sothi. I’m not sure what its called in English but its leaves and flowers look exactly like the rosella bush in Australia. I know the flowers of the rosella are edible and commercially available in jams and syrup. I’ve just not tried cooking the leaves of the rosella bush. Sothi is very easy to prepare. You start the base by bringing water, onions, garlic pieces, fresh green chilli and salt to a soft simmer. When this has been simmering for 10 minutes, bring it to a boil before adding whatever leaves you are using. Turn the flame off as you only want the greens to be wilted. When it is cool, add fresh cows milk or coconut milk. Let it cool first, otherwise the milk will curdle. The sour leaf used in today’s sothi has quite a high acid content and is going to curdle the milk no matter what. It still tastes great though. This dish can be made using a variety of greens or fruits. 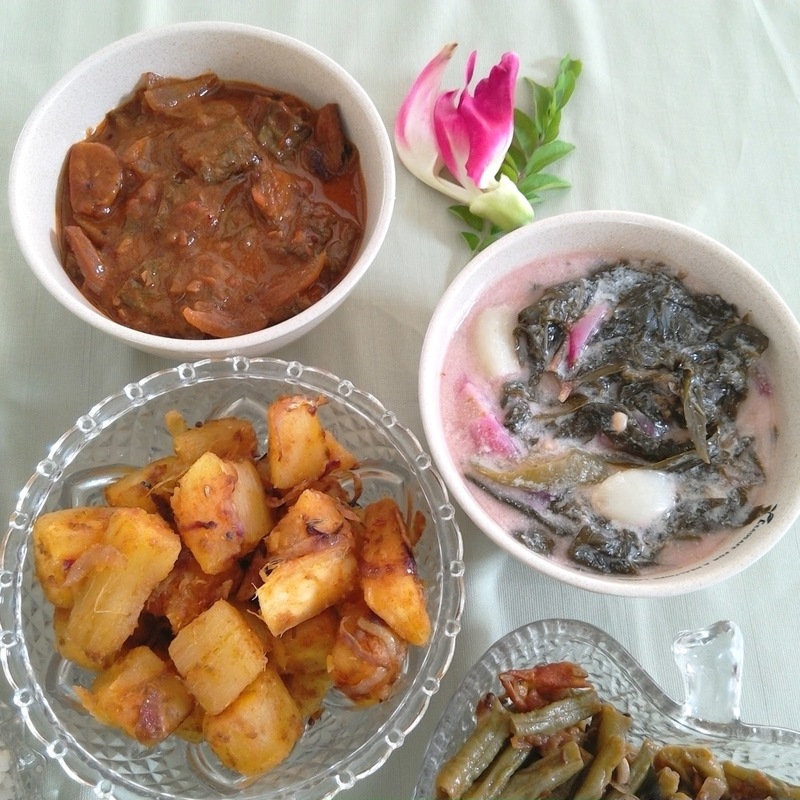 We eat a number of local greens such as sweet potato leaves, cosmos leaf and a green fern to name a few. 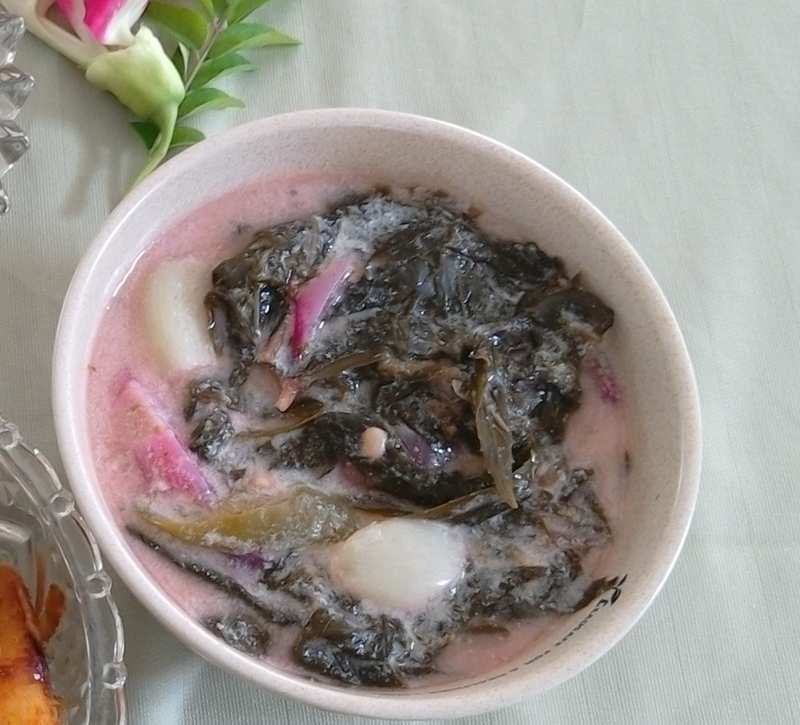 You can also make sothi with green mangoes, tomatoes and the belimbing fruit. Add the fruit at the beginning with the onions and garlic when you are making this kind of sothi. In Australia, I have also made really tasty sothi with rhubarb stems. Bitter gourd is known for its benefits in killing intestinal worms (I remember being dosed with freshly squeezed bitter gourd juice as a kid) and in controlling blood sugar levels as well as its very bitter taste. When it’s cooked like this, where it is lightly fried before being made into a gravy strongly flavoured with chilli, coriander and tamarind juice, the bitterness is masked. The other vegetable in today’s lineup is long beans cooked into a mild dry curry. 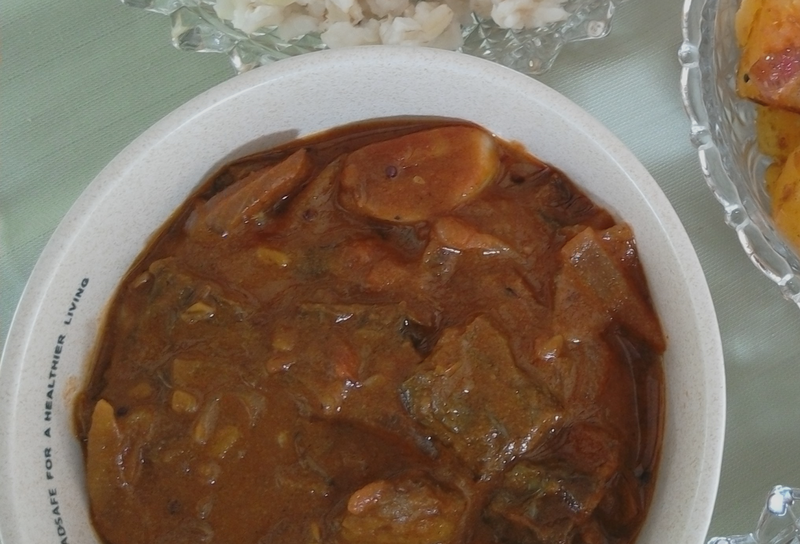 The mildness and dryness is achieved by adding only a little curry powder to the cooking beans and evaporating off any liquid in the pan during the cooking. Today’s source of protein is red dhal. Red or mysore dhal is not a favourite but we switch it around with toor dhal, chick peas and green beans (both polished and unpolished) to make sure there is a source of protein in the meal. Finally there are the savoury banana chips. These banana chips were made from banana’s from our garden. They are plucked young, sliced and deep fried slowly until they are crisp. When we get a glut of fruit in the garden, there are containers of this stuff sitting in the pantry. They make really tasty TV snacks. A Sri Lankan version of the potato chip. 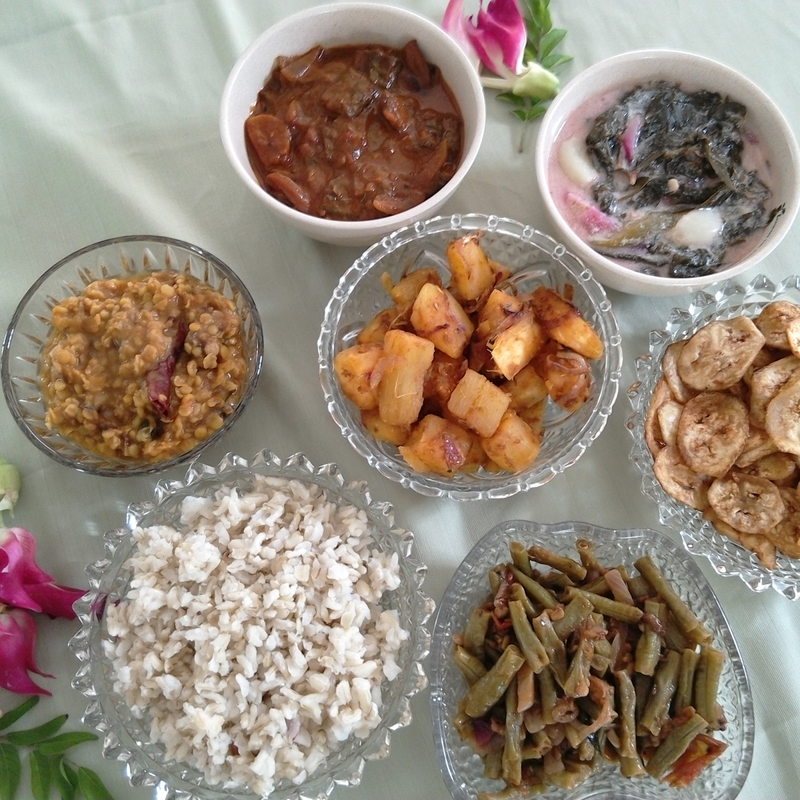 I have shared my mum’s recipes for the tapioca dish, the bitter gourd in gravy and the sothi below. Today’s dishes were prepared by Si. Place tapioca pieces in a pan and cover with water. Bring to boil and cook until a knife pierces the flesh easily. Drain the liquid and when cool, cut the tapioca into bite sized pieces. Add chilli powder and salt and coat pieces evenly. Peel the onion and slice it lengthwise to get long thin strips. Wash the curry leaves and remove the stalk. Cut the dried chilli into 1cm lengths. Heat the oil in a wok or frying pan. When hot, add the onion and curry leaf and fry until onion is soft. Add the seeds and dried chilli and fry until the mustard seeds pop. Add the boiled tapioca and keep turning the pieces over low heat until a crust starts forming on the tapioca pieces. Turn off the heat and transfer the tapioca to a dish. Cut the bitter gourd in half lengthwise and discard pith and seeds from the centre. Cut the remaining flesh into 1 inch squares. Heat oil in pan and deep fry bitter gourd pieces until it’s just turning brown. Remove from oil and place on a stack of paper towels to drain. In another wok or pan, heat 2 tablespoons of oil. Fry onion, garlic and curry leaf until onion is soft. Add fenugreek, mustard, cummin and fennel seeds to the onions and fry until the mustard seeds pop. Add a 1/1/2 cups of water to this. As it’s coming to a boil, add the curry powder, chilli powder, salt to taste and fried bitter gourd. when boiled reduce heat to keep the curry simmering. When the water has reduced by a half, add the tamarind paste. Keep cooking on low heat until the gravy thickens to a sauce like consistency. Turn off the heat and dish out the curry. Place water, onion, curry leaf, garlic, chilli and salt in a pan and simmer for 10 minutes or water is reduced by 1/2 a cup. If using green mango or rhubarb stems, add them now too and simmer. If you are using a green vegetable, add it at this stage to the hot liquid and turn off the heat when the leaves are wilted. Let it cool before adding the coconut milk. This dish can be warmed slightly just before serving. Do not bring it to the boil or the milk will curdle.